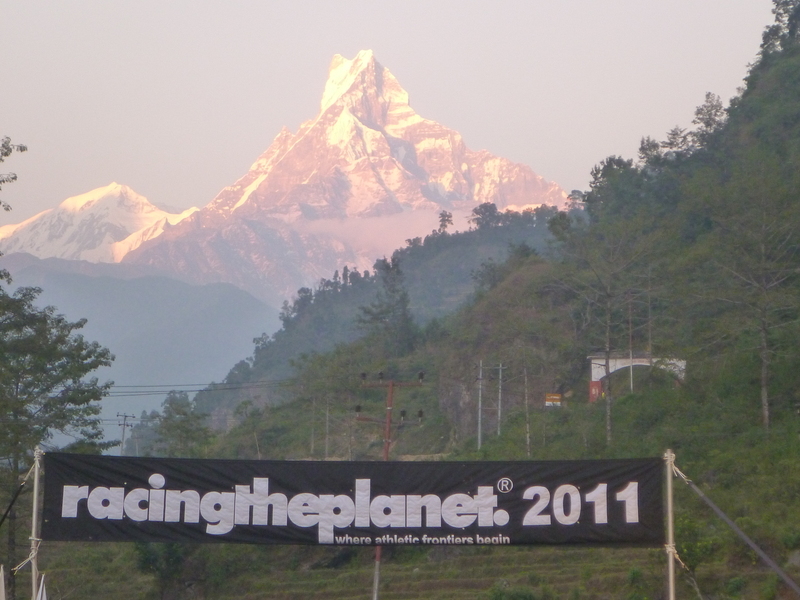 Intro: In November 2011 I participated in Racing the Planet Nepal on behalf of Mencap. Each day I was able to send one e-mail recapping that day’s stage. These are them. If I’d written this message within an hour of finishing today it would be much different. I thought I’d be telling you that I had to withdraw. Huge thanks to everyone who sent me messages in advance of finishing today. So what’s the good news? The course is now 210km. Why? The terrain is insanely difficult. About 5km in my left IT Band lit up. It was manageable until the last 5.5km (today’s stage was 28.5km with 3,000m of elevation change). I honestly questioned whether or not I’d be able to start tomorrow. I am happy to say that I am still on pace for my first goal of this race – no crying on the course until I’ve finished 100km. 4 hours after finishing and lots of stretching later, using a 1L water bottle as a roller for my leg I’m thinking that my pace will just change dramatically. I’m currently sitting in 84th of 220 but placing doesn’t really matter. We haven’t been told how many people have dropped but I’m guessing 10 – 20. Before I get into the course itself if anyone has any MacGyver-esque suggestions for making my IT Band remotely better here’s your toolkit: yoga strap, voltaren cream, tylenol, advil, compression sleeves and a 1L water bottle. It hurt to pivot externally but not internally. Came down steps by crossing the left leg over my right. Alright, so the views? Amazing. Fishtail Mountain hung over us for most of the day as we climbed Grouse Grind stairs for 9.4km. 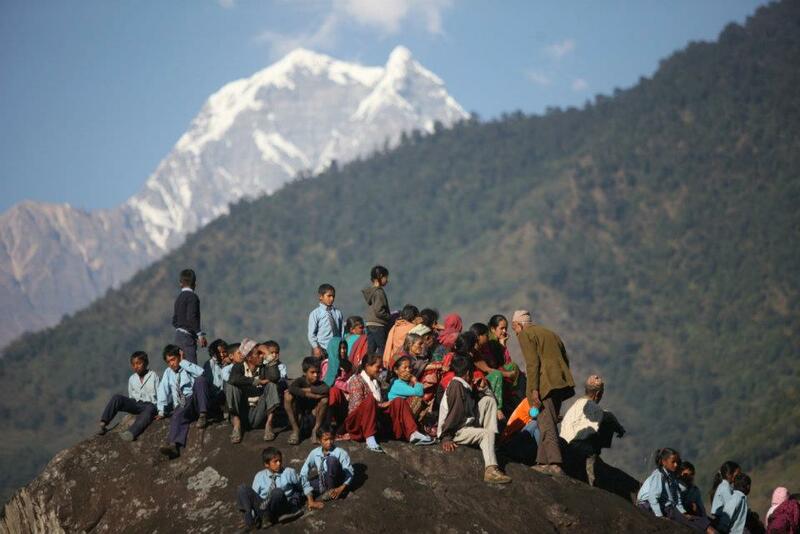 And they came down them weaving through Nepali villages for 11km. I’ve never said Namaste so many times in my life as the course was lined at various points with school children smiling and clapping. Ridiculously cute as they ask your name and then shout it as you keep running on. It’s unbelievable how these villages will just pop out of nowhere. 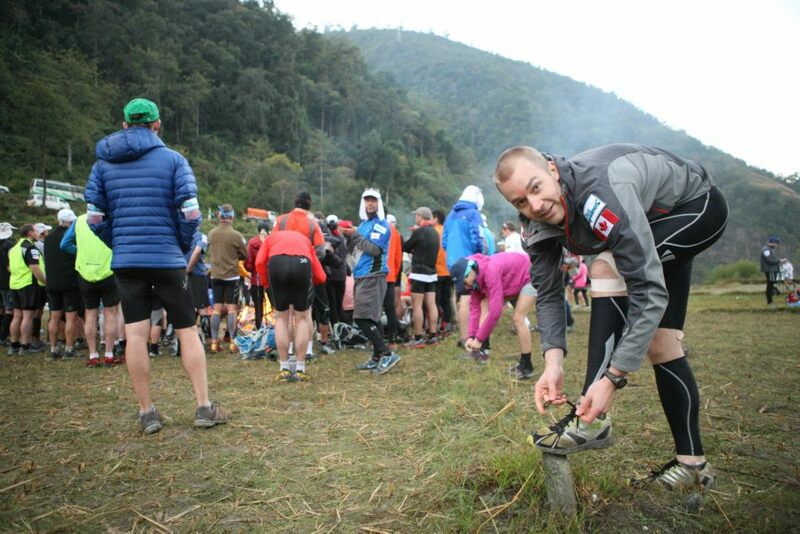 The other challenge is the amount of smoke that comes out of all of the villages making it really hard to breathe. The heat today was also surprisingly difficult as the concrete and clay of the houses magnified the temperature. Sleep comes in spurts but is welcome when it does. Met a bunch of great people so far. And I am looking forward to this experience growing. The terrain today was also like taking the most difficult sections of each run and stitching them all together. A bunch of people took a wrong turn and added about an hour to their day. Thank the maker that wasn’t me. Alright kids, sorry but I’m bagged and need to eat some really awful freeze died food before crashing. Thanks again for the emails. They mean the world and help me put one foot in front of the other. And in case anyone was wondering, yeah I still got this. Looking forward to hugging it out. So as it turns out the sure fire way to distract from IT Band pain is the sudden onset of projectile vomiting and chronic diarhea. Yeah, you’re all welcome. And be glad I am sparing you the Michael Bay special effect details. I don’t necessarily recommend this option but it works! There’s a 24 hour virus ripping through camp so I’m glad I got it early. I didn’t know if I’d start today but after visiting the med tent this morning I gathered myself and decided to make the call at check point one. “It’s impossible” said pride. “It’s risky” said experience. “It’s pointless” said reason. “Give it a try” said the heart. As a result of being sick I had about zero food in me to start the day and was very dehydrated. It took me about 4 hours to eat 1 protein bar. I also managed 2 gels and some potato chips for a grand total of 500 calories. I also just managed to eat half my dinner for tonight for a daily intake of about 900 calories. Likelihood that I lost 3 – 5 pounds today? Very high. As we ascended a set of stairs, okay, that is the understatement of the century. We ascended 1453 metres of stairs over 2km. As a reference for Vancouverites, the Grouse Grind is 900m over 2.8km with a 33% grade. I’ll ask you all to do your own math for how steep that section was today as I am pretty exhausted and my math will be terrible.Anyway, I caught up with a guy from Australia who had caught the plague as well and we soldiered on together. Neither one of us could really eat and we gradually at least got some electrolytes in. The next 90 – 120 minutes were probably spent without any words being exchanged between us. We hit checkpoint in pretty rough shape and rested for a bit. Naturally I busted out so instant coconut water. Feeling and looking quite haggered we gathered ourselves for the final 14.5 km that were mostly downhill. A couple sections I had some trouble with my IT again but overall I was able to lengthen my stride because the terrain wasn’t as steep as yesterday. 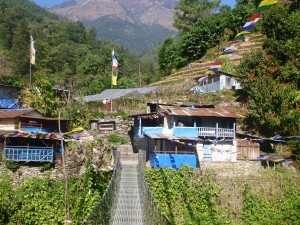 Trudging through villages our pace quickened and we headed towards a new mountain range. There wasn’t as much smoke coming from the villages today so that was really good for me as yesterday the smoke did a number on my lungs. About 700m from check point 3 I got a huge adrenaline rush. 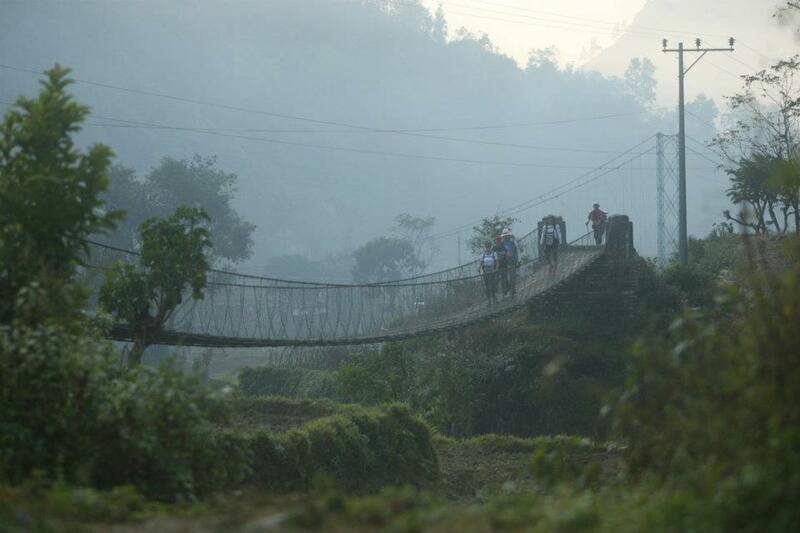 We could see the first suspension bridge spanning 100m and hanging 75m above the valley floor. Awesome. This resulted in an all out, ill-advised, teenage inspired sprint and the three of us crossed the finish line together. Somehow I’ve managed to move up 5 spots to 79th overall. People are still coming in today but 11 dropped yesterday and I’m expecting another 10 – 20 today. I have now realized that everyday there is going to be a moment when the course asks me if I will do this or not. It simply isn’t a question of ability or capacity. It is a question of will, constitution and depth of faith in yourself. So far I seem to be holding my own. Oh and random cravings for today? A head of iceberg lettuce. I would literally take it with two hands and bite straight into. Vegetables are sorely missed out here. This needs to be accompanied by a bottle of orange Fanta. It absolutely must be a glass bottle. Heaven. Thanks again for all the messages. It means the world and is the part of the day that I look forward to most. Your inspiration keeps my company when I am loneliest out there. Alright. So it happened. Not in the 6 year old girl way. Ever so slightly with about 2km to go today. I was reflecting back on all the messages you’ve sent and since I’d hit 123 km in the past 4 days I figured it was okay to let some of the tears come. People started out today at a blistering pace as it was a shorter stage before the Long March. I, however, preferred something more along the lines that Eeyore would be comfortable with. The first 10km climbed over 1200m to get us to over 2800m (10,500) in altitude. This was a long slog. 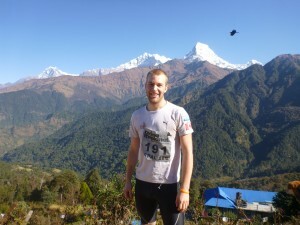 The air was pretty thin but the views of Annapurna South plus some of the world’s other tallest mountains were amazing. My goal for today was actually just to get through without injury. Glad to say that is the case. Continuing to descend the stairs we passed through a number of small villages and guesthouses. The views are amazing. None of this route is accessible by vehicle so absolutely every single piece of building material had to be carried in. I cannot count the number of times an 8 year old has run up along beside me, taunted me and taken off. After moving through checkpoint two the rest of the course rolled into camp. Biggest highlight of this section was running along a stone wall because the trail was packed by 12 mules all loaded up. One of which had 2 propane tanks attached to it. Finished today’s stage in 55th on the day and still not sure about overall. Tomorrow will be the single most physically and mentally demanding day of my life. 72km. Non-stop. 6000+ metres of elevation change. It could be as much as 16 – 20 day so if I’m a little late on the update, don’t worry’ it’ll come.running along a stone wall because the trail was packed by 12 mules all loaded up. One of which had 2 propane tanks attached to it. The real challenge begins tomorrow. Thanks again for all the messages. Took me 20+ minutes just to read them. I cannot convey properly in an e-mail what an inspiration all of the messages to me have been. To have such a remarkable group of people supporting me has made this all much more manageable. Each day has progressively gotten easier but that 72km after having already covered 125km – hardest.thing.ever. 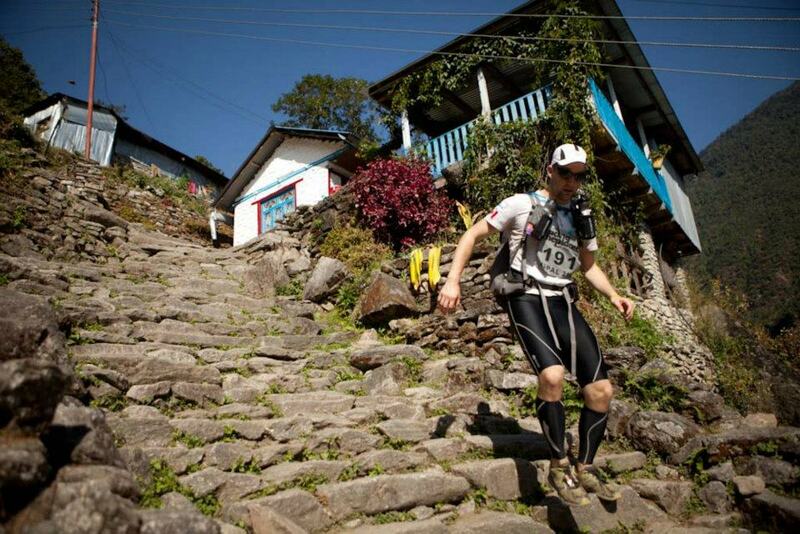 The route rolled through the foothills of the Himalayas with some very steep climbs. I set out with a couple of the Aussie guys I’ve met here and pushed a pretty solid pace. Much of the climbs and descents in the first three legs (of eight) were quite slippery; even marked with caution tape. It became quite hot early in the day and we were running out of water between checkpoints. I got through the 5th checkpoint at about 5:00pm – already a 10 hour day. I tried to move as quickly as I could knowing there was about 30 – 40 minutes of daylight left. The final 35km of the stage were in the dark. 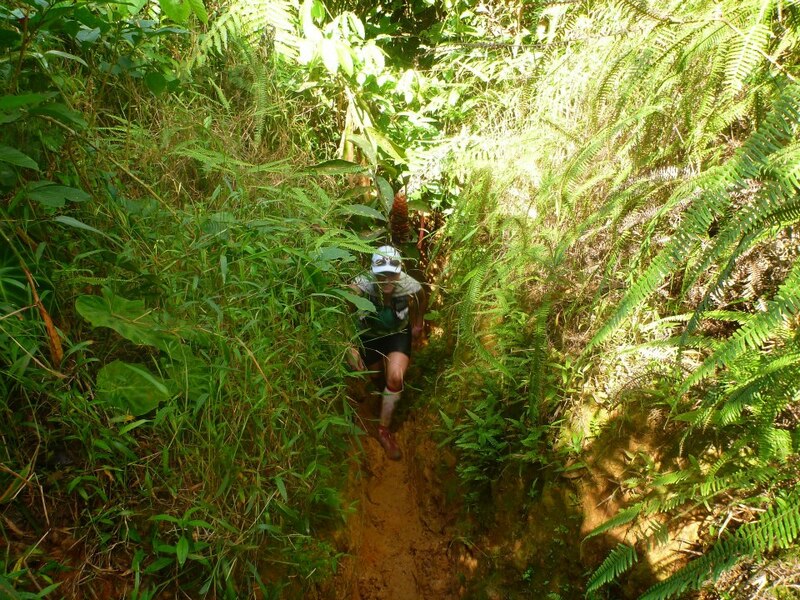 The downhill of leg 5 was steep and difficult to manage with just a headlamp. Whoever decided the best way to build a road was to arrange paving stones in a vertical format needs to have a chat with me. Fortunately the rest of the 30km was comparatively flat. Running / shuffling wasn’t much of an option but I still stuck my head down and set a pace that had me covering 9km every 80 min. The final 20km are a bit of a blur. It is remarkable how hard you can push yourself. I didn’t stop at any of the final 2 checkpoints because I couldn’t afford to stop moving. The fatigue, pain, level of discomfort and frustration of knowing that the incredibly unhealthy meal you are salivating for that would normally help you get through the last part of your run isn’t a possibility for three more days are crushing. Seriously. For 19km all I could think about was sitting at Vera’s Burgers with a turkey burger in one hand, a lamb burger in the other, and a double order of fries. Most of this section was rocky road except for one patch of about 30′ that was freshly covered in straw. It was begging me to lie down. At times I just wanted to close my eyes for half a second but I knew it would be over if I did. Several times during this section tears welled up again. Pushing through the last climb the final 3km wound around a mountainside before descending into camp. 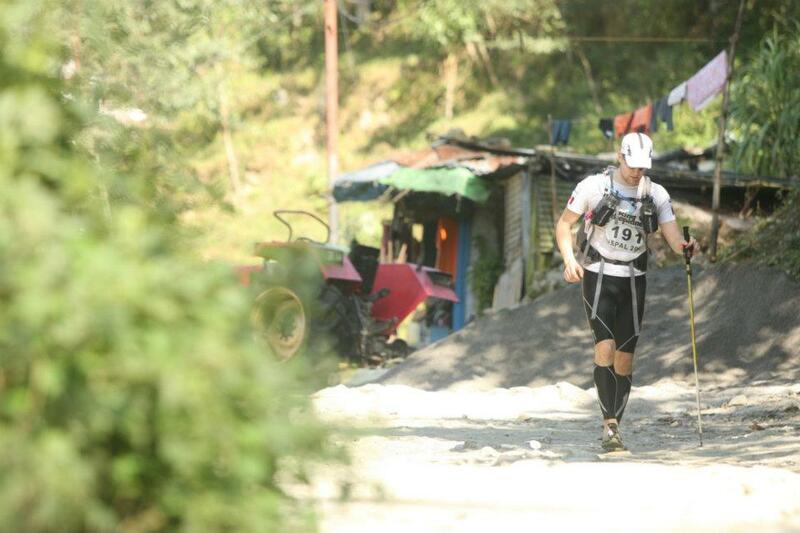 14:45 minutes after I started I crossed the finish line of Stage 5 – battered and bruised but not broken. While I have tried to put to words the experience of the last few days there is no way I could have properly captured it. The agony of Stage 1 seems forever ago, the doubt of being able to start Stage 2 is still in the back of my mind, the loneliness of Stage 3 probably saved me, Stage 4 was about being patient, and Stage 5 was an experience unto itself, tomorrow Stage 6 will complete everything by bringing many more questions. This has been a learning experience the depth of which I am unlikely to understand for many more months. As opposed to learning more about myself I have discovered how little I actual I know. For this opportunity I am grateful. One more update tomorrow, 197km down in just over 39 hours. 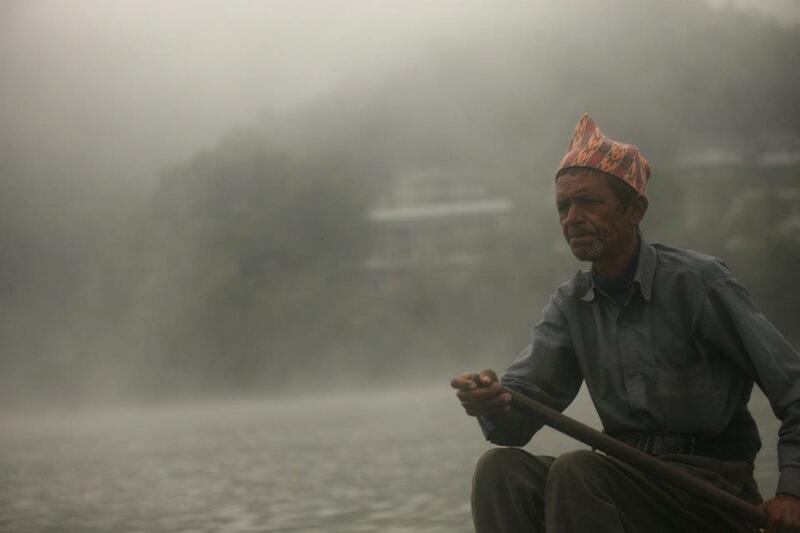 Today started out rather uniquely with a 40′ canoe ride across a lake just outside of Pokhara. All remaining 170 competitors were ferried through the mist to the far side. 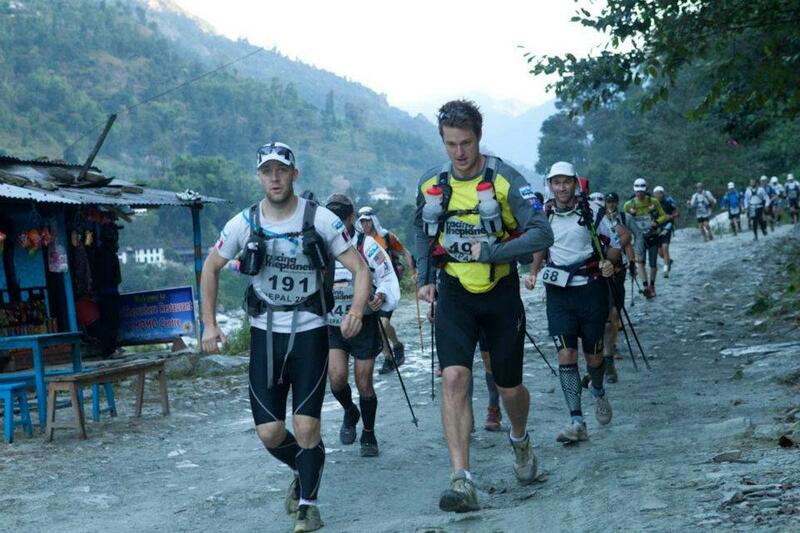 Shortly after 9:00am we began the final 13km leg. Running through rice paddies, creeks, rivers, back roads, more rice paddies, a quarry, another rice paddy, a couple more back roads we eventually came out onto the main road back to the race hotel. I managed to run most of it, nearly crashing a couple of times but in the end pulled it together. I got a massive surprise as a friend who had just trekked to Everest Base Camp was standing at the finishing line with his wife. Totally unexpected and an absolute rush. Coming into this event I did not know what to expect. At parts of each day I did not know if I would finish. There has obviously been some self discovery and recognition that there is much left to learn about the world and myself. Both of these facts excite me. The messages people have sent have really been the galvanizing factor in keeping me focused and able to block out the pain as well as the doubt. Over the next 2 – 3 weeks I am going to try to write everyone back to thank each of you personally. It is far too early for me to know what the next adventure or charitable cause will be; there is some physical healing and experiencing digesting to do first. I still haven’t been able to fully wrap my head around the past week, the various challenges faced and overcome, and the overall experience. I would like to thank all of you for being part of and enhancing this experience for me. My life has become richer for it. I’ve got access to my email now so if you are interested in writing back please just reply to this email. It may take a few days for me to get back to you as I’m off to Vietnam tomorrow for a week of R&R. The pace starts out fast, too fast. The stage began at 9:30am on the streets of Quepos in 36 degree heat and 97% humidity. My first 11km were done in 63 minutes and that’s when I knew I was in trouble. I didn’t hydrate properly and struggled through the middle section of the race. Fortunately it was mostly climbing which is a bit of a specialty for me. The day was saved by lying face down in a river as I caught back up to Gemma & Pavel. I wasn’t able to keep up and found Shawn sitting under a tree at the 27km mark out of water and 3km from the next aid station. Overall only one of us hydrated properly. Slogging through the last 5km I couldn’t quite catch Pavel, who upon finishing had his calf cramp up pretty severely. He’d spent the last 5km without water. 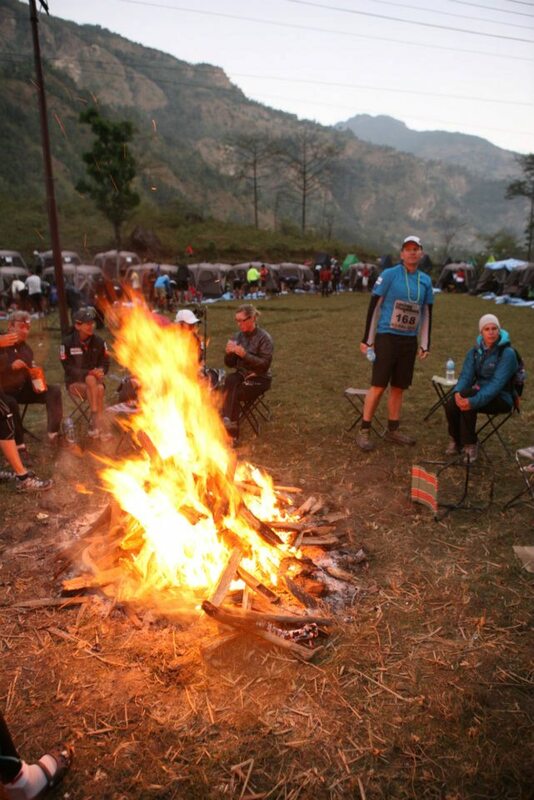 Tam & Tony got into camp about 8 hours after we started the 33.6km day. Tony having not eaten in 5 hours. This race has taken on a different dynamic for me and I’ve put some unnecessary pressure on myself as a leader, motivator and runner. Gemma & Shawn both have the ability to beat me on any given day but still I pushed too hard early on day one. I need to put my running ego on a shelf and focus on supporting the team and ensuring that I maintain the ability to finish each day. Nearly every person on the team called day one the most humbling experience of their life. Tony undoubtedly had the toughest day. At the end of the day he asked “how am I going to do this for 5 more days?” I have never had someone look at me with so much fear and desperation in their eyes. It scared me. I sat down and we put a mini plan together to just get through the evening and deal with day two tomorrow. After our chat, looking at my team and my friends, exhausted, humbled and aching I wondered just what had I done by putting this challenge in front of them. It is difficult not to feel responsible for how these people feel physically & emotionally. 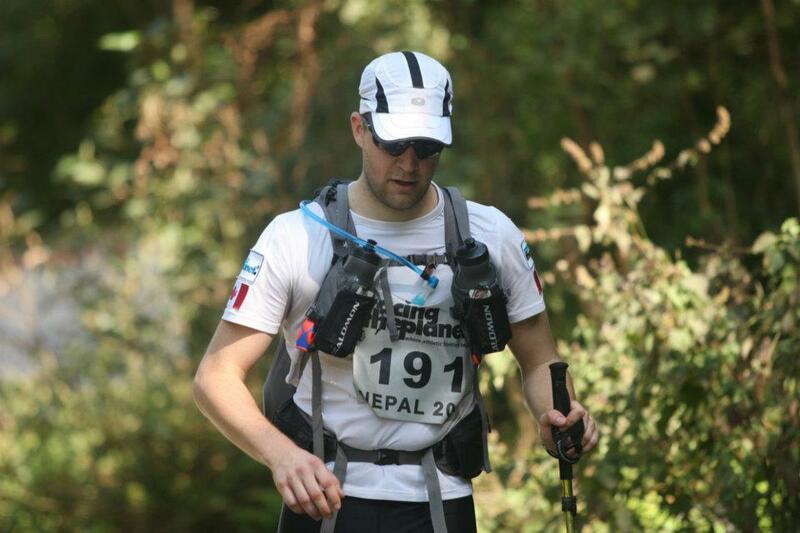 This time around I didn’t get through 37km without crying, nevermind the 118km I got through in Nepal. It’s moments like this that I wonder whether or not you show your weakness. I hid it from my team in an effort to ensure their doubts or fears don’t grow. They see me as a bit of rock and after only 1 day I needed to keep it that way. Every great accomplishment begins with a decision to try. As much as we had our challenges, Gemma raced herself to a second place female overall position, which is amazing considering the caliber of runners here. Tony has gotten some food into him, 3 people have seen the foot doctor and my core temperature seems to be dropping. I think my water intake for today was about 12L. Tomorrow we head out for 39km and I’m looking at 7.5 – 8 hour day. Wake up is 3:45am and a 5:45am start. I’ll have a better game plan tomorrow. Day 2 started out with two grouse grind style elevation climbs. I love hills and could happily go up for days. For others, like Gemma, they make her really nervous. The game plan today was for Gemma to hold on to we second place standing. What this meant was I was going to have to push both my pace and hers. The jungle is thick and muggy. Mud is everywhere and devours your feet. You hear animals everywhere but can’t see them. It sounds like a stadium full of vuvuzuelas buzzing all at once. This leads to both technical climbs and descents. I lead Gemma past a number of runners and when we crested the second peak and came out onto the ridge she was in fourth by about 50m. Descending through cow pastures we quickly caught the 3rd place female. We raced through a number of river crossings – stopping to submerge ourselves each time. At 23km with 16km to go I told Gemma my pace was about to change dramatically and she needed to go. Tying for 2nd on the day she’s having a hell of a first race. 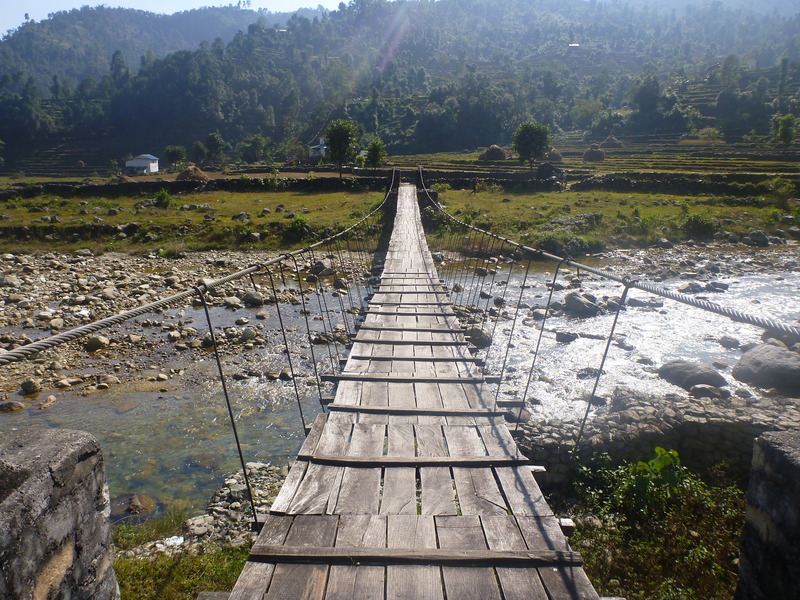 The rest of the day was more of a trek than a run for me, which included a couple of waste deep river crossings. The final 8km were on the beach into Dominical resulting in phenomenal tan lines. Tomorrow is our longest day and starts with a 25km climb, which actually just relieved me a bit. Hopefully it’ll give me some time to recover. It will start off wet as we literally run upstream for 10km. 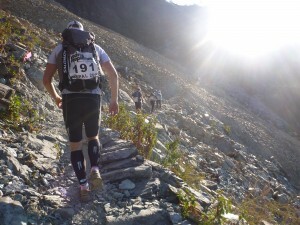 We’ll descend for 12km before rolling the final 15km. Yeah – 52.5km. Yikes. Early and at mid-point of today I had a couple ideas / thoughts for how I could kick this off. The journey up the river was actually pretty fun switching back from side to side. Wading through it and even full on swimming at one point. I had set out this morning to run my race at my pace. Through the river section Shawn, Pavel, Gemma and I were all together having a ton of fun sharing the experience. Once out of the water we made our way 4km to a tiered waterfall – you know, the kind you see on the cover of romance novels. Running my race I stop for a quick photo and continued on my way beginning the climb to the 25km mark. We opened up onto a ridge where the sun started to hit us. My Spanish goes a long way down here getting us into people’s yards to hose ourselves down and refill our water. The four of us reunited and went through some pretty great single track stopping at streams to cool down on hydrate – special shout out to LifeStraw, google it, you’ll want one. I reached checkpoint 2 first, grabbed a seat to hang out, change my socks, eat some tuna fish out of bag – yes this product exists and it is one of two food items that I cross border shop for, oh and if anyone wants to deliver / make me some Chobani peach mango frozen yogourt that would be heaven. After CP2 it started to rain a little, which cooled the temperature and I took advantage over the next 4km. The descent then began to look like that straight down water slide you’re afraid to even look down. Checkpoint 3 reunited Shawn, Pavel and I. I had figured that at some point both Shawn and Pavel would catch me because the heat would get to me (insert foreshadowing). Shawn still had some great speed left in him with Pavel a few hundred meters behind me on the 10km beach section. We were both hurting a fair bit so Pavel suggested we take a swim I though it was an amazing idea. At the end of the beach section we were walking and grateful for the cold stream waiting for us. We both lay there loving every second of it and enjoying our bodies cooling down. After drinking some water we climbed aka bushwhacked up to the final water station. 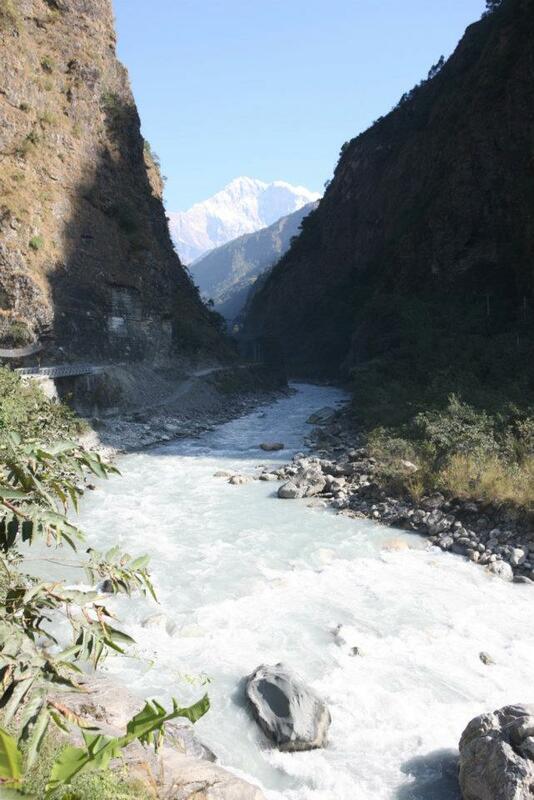 Even that short climb erased any memory of the cold stream below. I let Pavel know what was going on as he caught up with me and we had about 800m to go. Like all boys will we still managed to race each other at the finish line. Pavel headed to put his feet up, I went straight to the med tent. Getting as much ice on me as possible, including my neck, shoulders, head, chest and groin I sat for about 60 – 90 minutes drinking 2-3 liters of water and eating what I could. I eventually got cleared to go without needing an IV which was a huge relief. I spent a lot of time thinking about the stage tomorrow and the following two. There is very little free flowing water on course for day four and only one of which you can drink from. Day 5 is another 47.5km. I’ve talked to everyone on my team individually and very difficulty, emotionally, disappointingly with tears in my eyes let them know that my race is over.